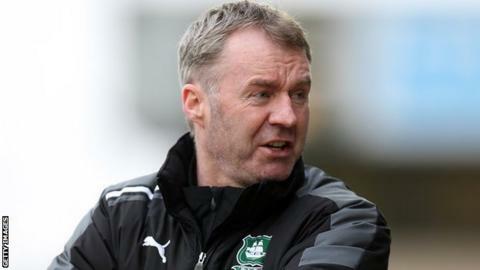 Plymouth Argyle manager John Sheridan has criticised his players after their fifth defeat in six League Two matches. "We are so quiet as a group and I really do think that's the biggest problem we've got," he told BBC Devon. "Sometimes I sit there and I've asked the question and no-one says a word. They're a good group of lads, but we're not going to get anywhere being nice." Sheridan says he would welcome his players standing up to him in the dressing room and criticising him. "I would like four or five of them to have an argument with me in the changing room after a game," he continued. "We are so quiet as a group - I like people with an opinion, and if they're having an argument with a player I respect that and appreciate that because they care. "We're so quiet, and I need to get those four or five players who are going to get onto the other five or six who are in the squad." Since Argyle moved into the final play-off place with a they have won just one of their seven fixtures. And Sheridan, who guided Argyle away from relegation last season, felt the need to say sorry to supporters after their recent form. "I'll apologise because I really thought we'd get in the play-offs," he said. "I thought we had good enough players, but for some reason we haven't, and that's something I've got to look at. "We're just very flat at the moment and I don't know what the reason is. "One or two people are ready for their holidays and it could be a very long holiday for some people."